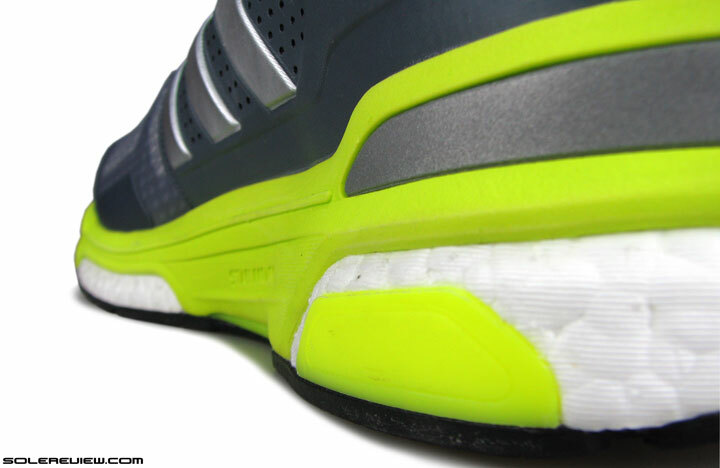 adidas’s marketing pitch: Energy returning cushioning and a lightweight, natural ride. Upper: Engineered mesh, fused urethane, plastic heel clip. Midsole: Boost foam with a firmer EVA rim around the midsole edge, plastic shank. 8 mm heel offset. 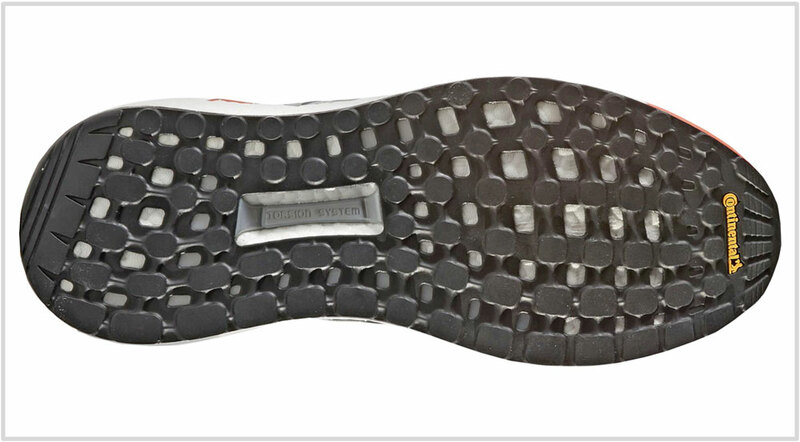 Outsole: Hard Continental rubber from the heel to toe. The Supernova ST is the replacement for the supportive Sequence 9, but only in spirit. The new model is much softer to run in, so you must take the ST’s ‘stability’ categorization with a large grain of salt. 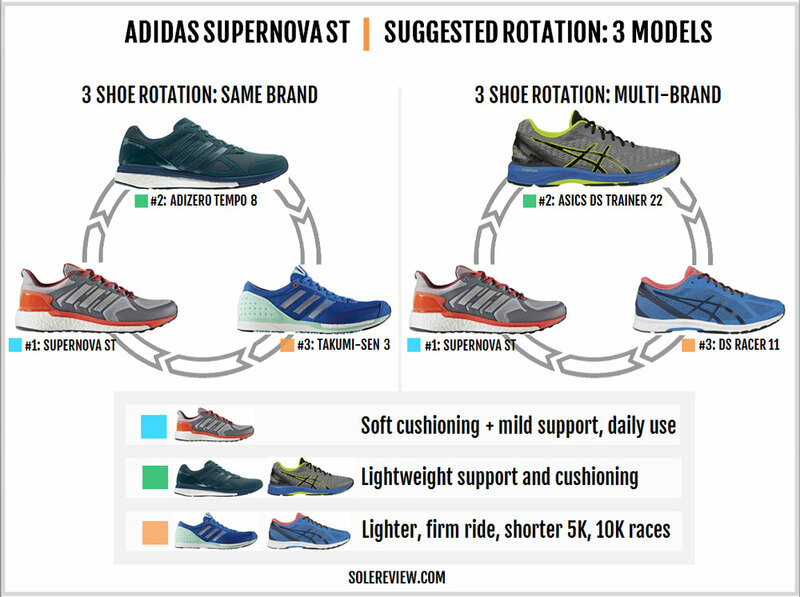 adidas gave the Supernova Glide a drastic makeover earlier this year, changing its balanced ride quality into cushioned mushiness. The fact that the Sequence would follow suit was a foregone conclusion; after all, the Sequence’s fate is tied to the Glide. 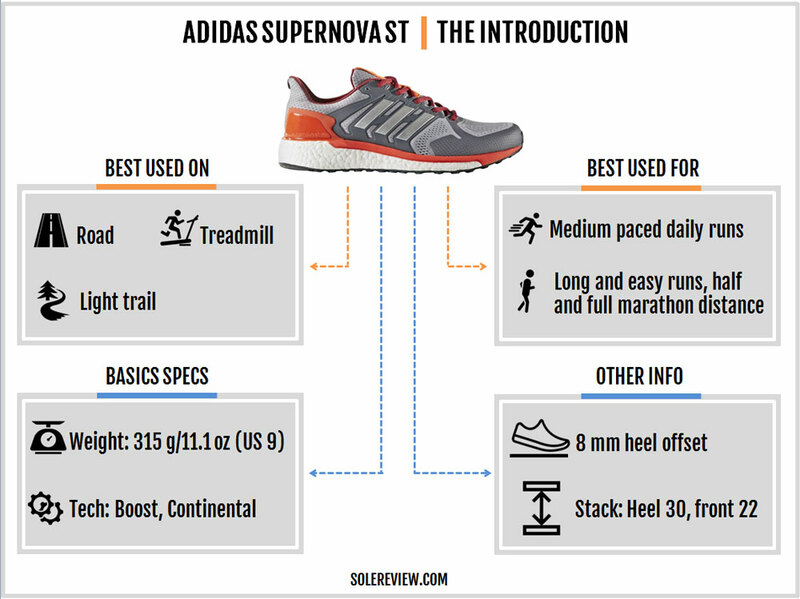 For those who are new to adidas, the Supernova Glide and Sequence have long been adidas’s models representing the neutral cushioning and stability category (respectively) at the mid-range price band. 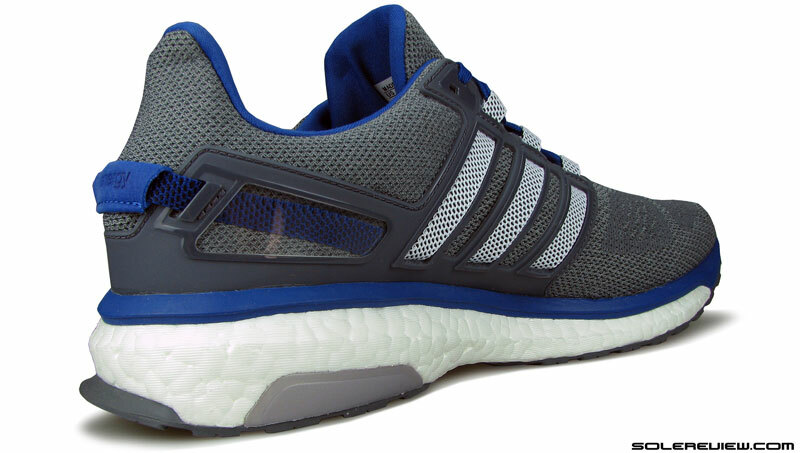 An MSRP of $130 put these models above the entry-level ‘Response’ assortment but lower than premium shoes such as the Ultra Boost and its support version, the ST.
Until last year, the Supernova Glide was a medium-soft shoe with just the right amount of cushioning softness, support and bouncy responsiveness. 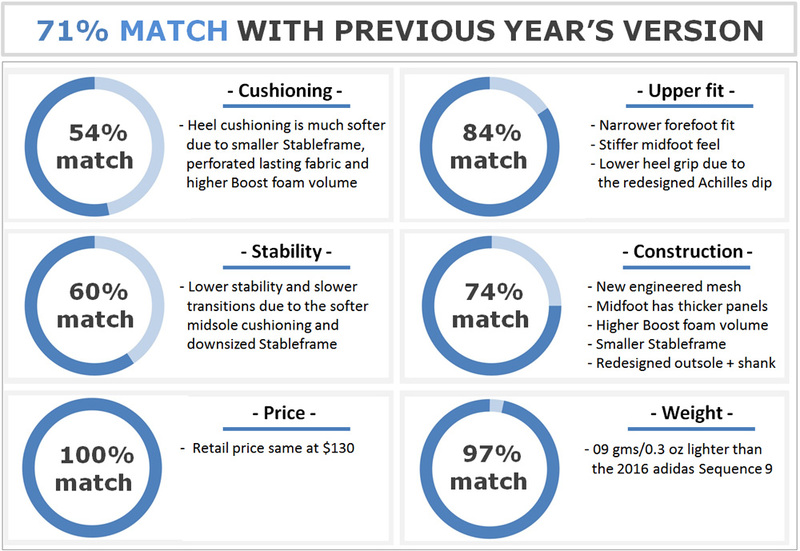 The Sequence was a firmer and supportive version of the latter, using a ‘Stableframe’ midsole to justify its place in the stability category. Well, that’s history now. The Glide 9’s (aka the Supernova M) super-soft ride has little in common with the Glide 8, and the same applies to the Sequence too. 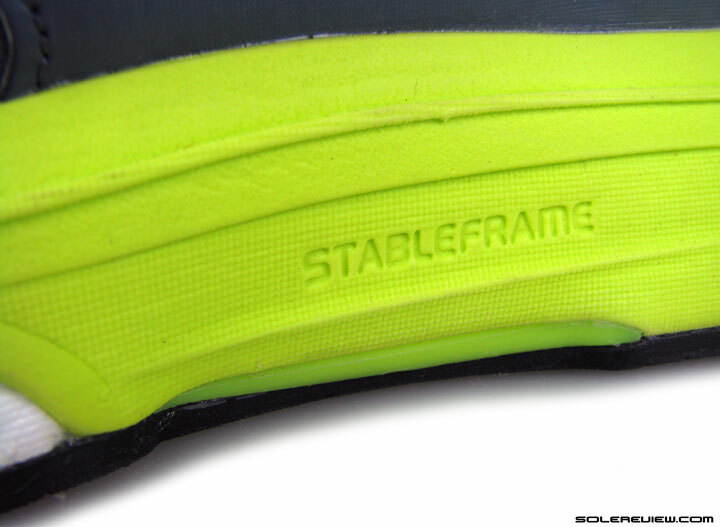 It loses the Stableframe midsole and instead gains a ton of cushioning softness. The resulting shoe bears little resemblance to the Sequence 9, so you really need to manage your expectations. adidas hasn’t quite yet figured out what to call the new shoe. 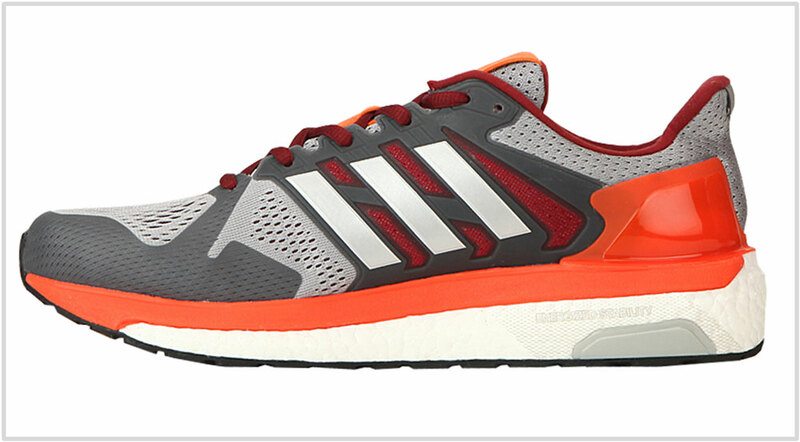 Depending on which part of adidas’ website you’re on, the shoe is named Supernova ST or the Sequence 10. So don’t be confused; the adidas Supernova ST and the Sequence 10 are the same shoe. The upper setup is typical adidas: lots of plastic and urethane fused over a mesh base. This has become the design standard for recent adidas running shoes, be it the Ultra Boost or various iterations of the Glide and Sequence. The forefoot uses engineered mesh with pores over the forefoot and the sides for ventilation, and densely-woven areas around the toe-bumper for support. The mesh is reinforced with a see-thru layer of fused laminate. A thick plastic cage clasp the midfoot on both sides, and the rearfoot has an external plastic counter with a U-shaped split down the heel center. This gives the heel counter a range of movement otherwise unavailable on full-sized counters. 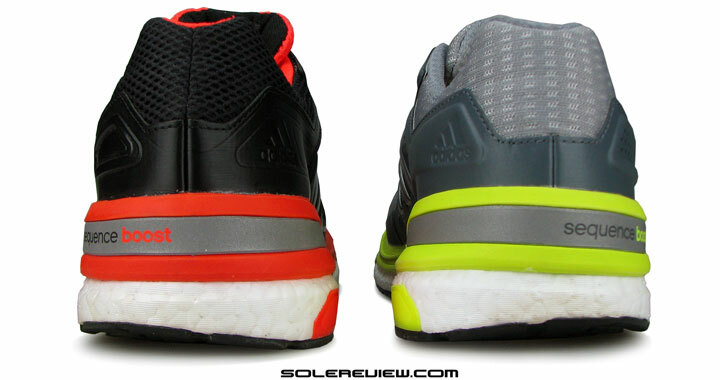 The Ultra Boost influence is also strong on the heel collar design. The Achilles dip extends outwards in a ‘lip’ shape, and the fabric used as the lining is soft with a nappy feel. There’s no sleeve holding the tongue in place, so adidas has compensated by making the flap very wide and adding a skewed lace-loop on top. The wide tongue flap technique has been successfully used in many Mizuno shoes to minimize tongue slide, and it works just as well here. We’re not sure whether the skewed loop works at all, so the jury is out on this one. There’s a LOT of Boost foam compressed into the Sequence 10’s midsole. Unlike the prior versions of the Sequence, the rearfoot is free of the firmer EVA cup. 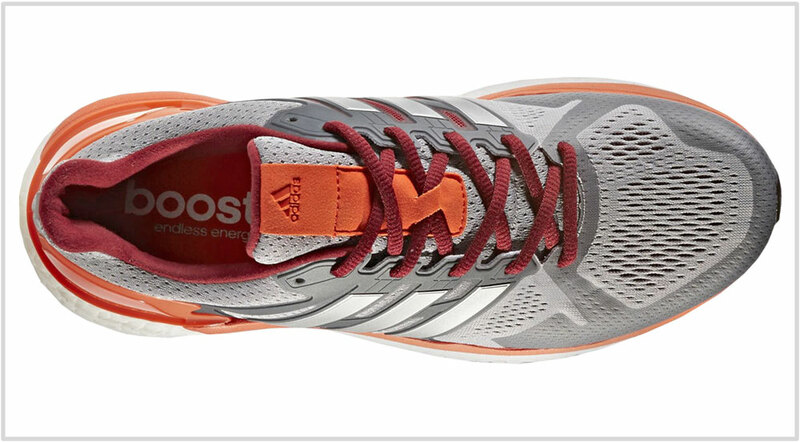 Like its neutral counterpart the Supernova M, the ST’s heel counter is affixed directly over the Boost foam. Inside, there’s a very thick insole which is removable. The stock insole’s thickness makes the Supernova ST suitable for use with aftermarket orthoses without having a detrimental effect on the fit quality. There’s a thin film over the medial side Boost. The foam density is the same on both sides. 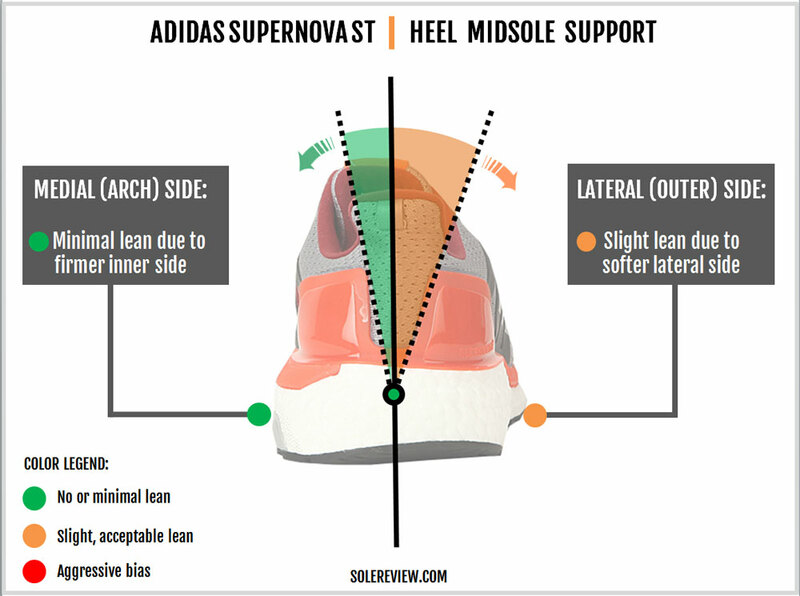 Medial side support is limited on the Supernova ST, giving it near-neutral manners. Adidas mentions that the Boost foam is ‘dual-density,’ but that isn’t true – as least in the real sense of that term. 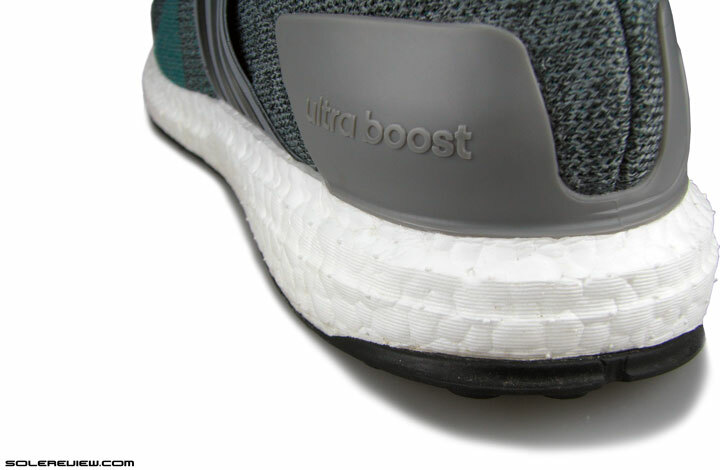 The Boost density is the same on both sides, except that a section of the Boost foam on the inner side is overlaid with a thin filmic laminate. This makes the Boost slightly resistant to compression, and this is perhaps what adidas meant by dual-density. There’s a plastic levee (also seen on the Energy Boost) which is an extension of the midfoot shank, and together with the laminate offers a mild level of inner side support. This is a picture of the Ultra Boost ST’s lasting fabric. The Supernova ST uses a similar material which places the foot in closer proximity to the soft Boost midsole. There’s an EVA rim over the Boost midsole, but if you compare it to the Sequence 7-9, there are a couple of major updates. The EVA no longer forms an additional layer over the rearfoot and is now limited to the edges. 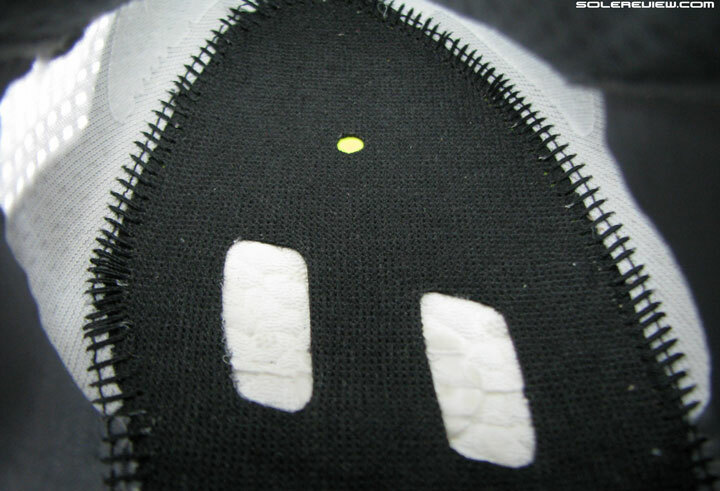 Instead, the lasting below the insole has now changed to a perforated fabric glued directly over the Boost foam. Which again, is inspired by the Ultra Boost ST. This treatment extends from the rearfoot to the toe area, which is in stark contrast to the Sequence 7-9’s forefoot-only cut-out. Needless to say, the Supernova ST’s midsole is very, very different than that of the earlier Sequence models. adidas still claims that the midsole is ‘Stableframe’ equipped, but the new design has little in common with the last year’s model. Same name, different show. The Continental rubber outsole has proven to be a hardy workhorse ever since its inception. 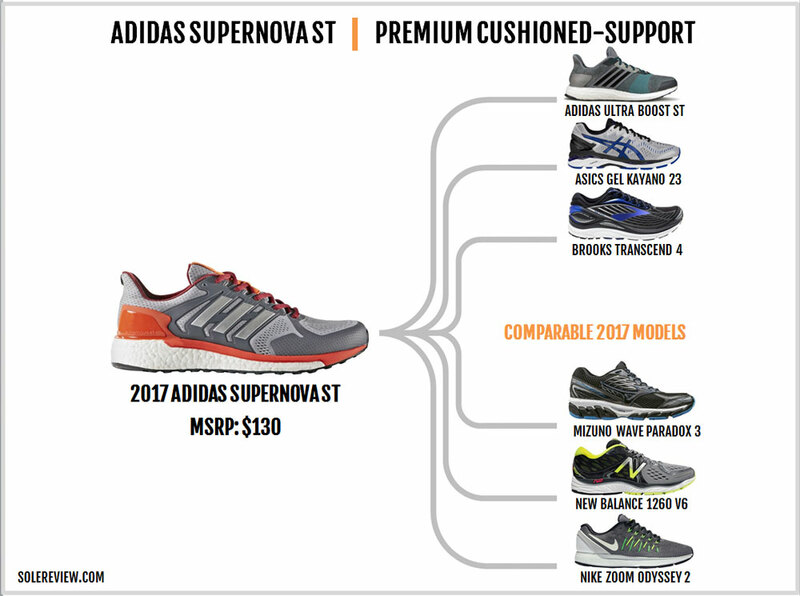 Continental rubber fitted adidas shoes outperform their industry peers in the durability department, and the Supernova ST uses the same material too. Over the last couple of years, the outsole layout has received its share of updates. Nowadays many adidas models have switched to the ’Stretchweb’ geometry. 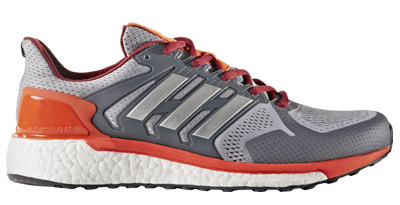 The said design uses a single sheet of molded Continental rubber with flat lugs and a colony of windows exposing the Boost foam above. 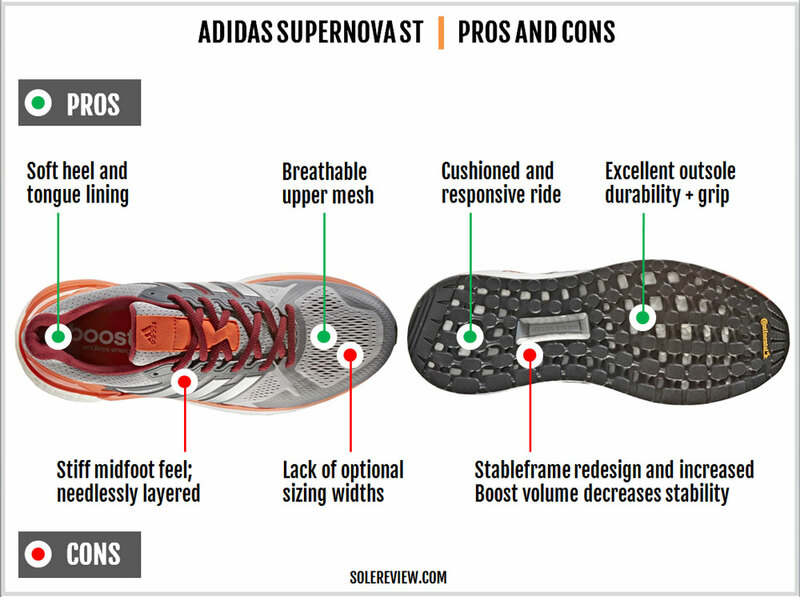 The Supernova M (Glide 9) used it, and the Supernova ST uses a near-identical outsole design. However, upon closer examination, differences begin to emerge. 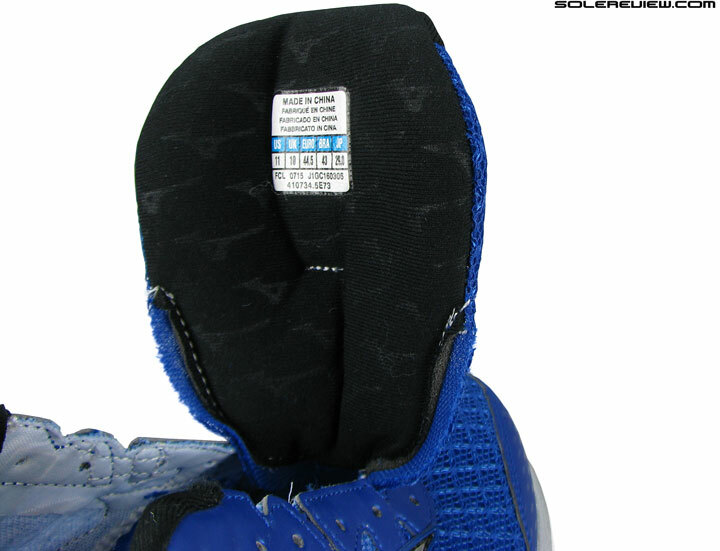 On the medial (inner) side of the outsole, the plastic shank extends partially into the forefoot. It also spans towards the heel to form the plastic support structure over the midsole. The outsole layout breaks character near the heel edge, where it transforms from a latticed structure to a thick block of solid rubber. This is good design thinking as the reinforced structure will better withstand rearfoot landings over many hundred miles. And lastly, unlike the Sequence 9 which had a section exposing Boost under the heel, the outsole is now a full-coverage type. 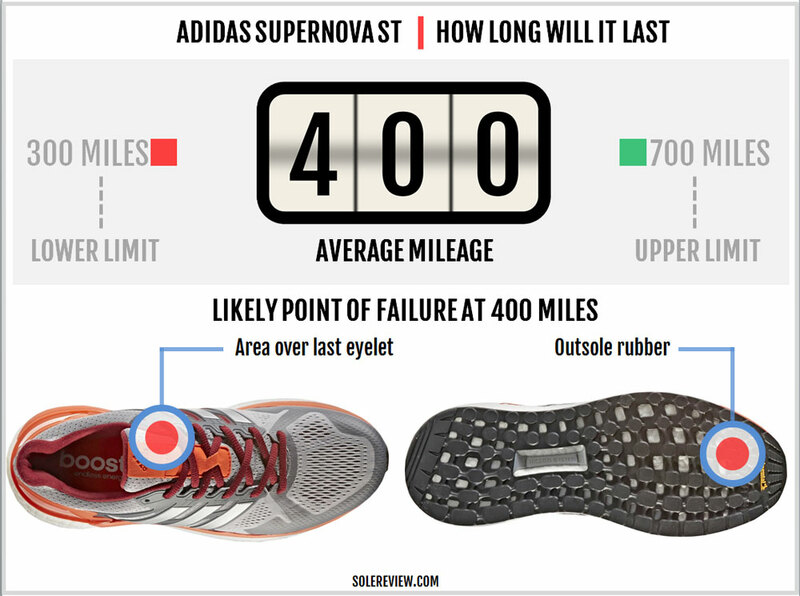 Like most adidas running shoes of late, the Supernova ST is very durable. The new Continental outsole is made of a hard and long-lasting rubber, so wear and tear will happen slower than the industry average. There used to be a time when the ‘Stretchweb’ outsole was flimsy, but those days are behind us. 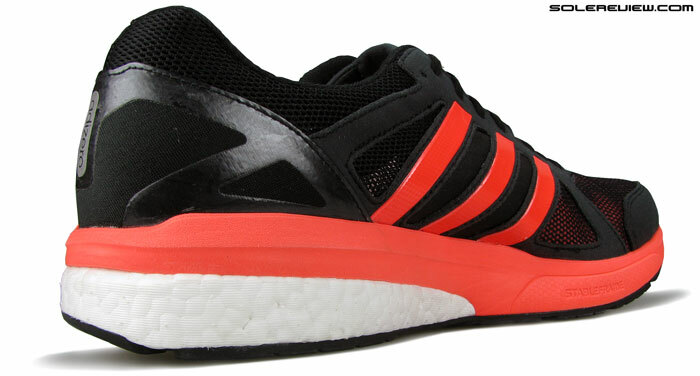 The mostly-Boost midsole has a long lifespan as it is relatively impervious to use-cycles and weather. The Polyurethane based material will outlive the upper and the outsole, not to mention retaining its cushioning properties in colder temperatures too. The upper uses durable plastic and Urethane parts over a thick engineered mesh, so there’s little reason for it to come apart soon. However, the last eyelet needs to be kept a watchful eye on. 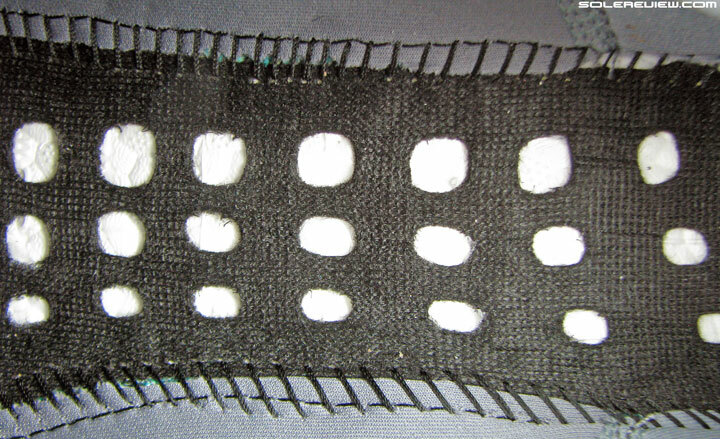 The eyelet is a part of a stiff component, so the mesh area above it tends to fail due to friction. We’ve come across quite a few cases on the earlier Sequence models which involves a tearing of this section. Combining an internal stiffener with a fused covering outside ensures dedicated toe-box height. The midfoot, like the many adidas models, feels over engineered. There’s more layering than what needs be, and you can feel the excess material on the sides. The last eyelet is stiff and needs some time to break in. The Supernova ST uses a soft and tongue lining which feels great over the foot. The tongue’s wide flap provides ample coverage while offering insulation from the lacing pressure. All that said, the quality of the heel grip is a mixed bag. While the flexible heel counter clasps the foot on either side, the outwards facing Achilles ‘lip’ does not feel very secure. During runs, the heel does not slip but lacks the confidence inspiring feel of traditional counter designs. 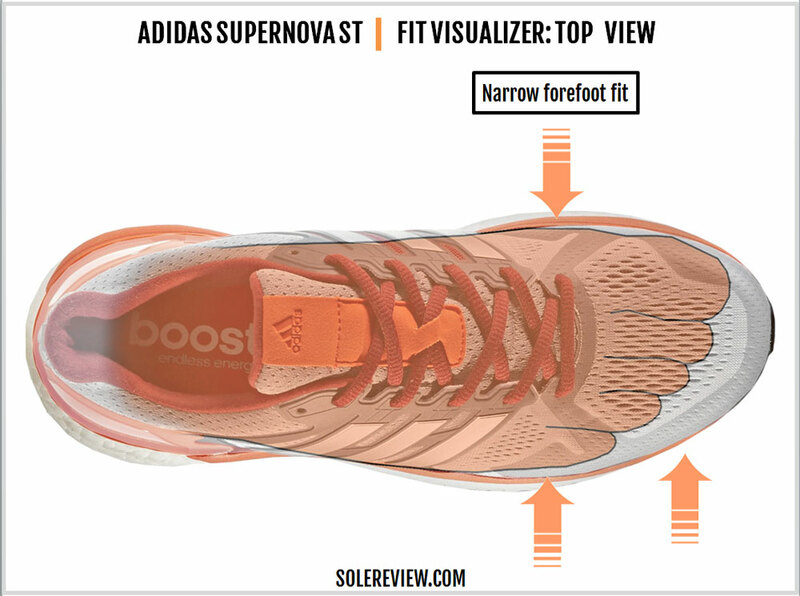 The Supernova ST fits true to size, but the forefoot is pretty narrow. The layering on the sides does not allow a lot of splay room, and what’s worse, the ST lacks the option of additional sizing widths. With all that extra Boost foam added to the midsole, the ST produces a very soft ride. 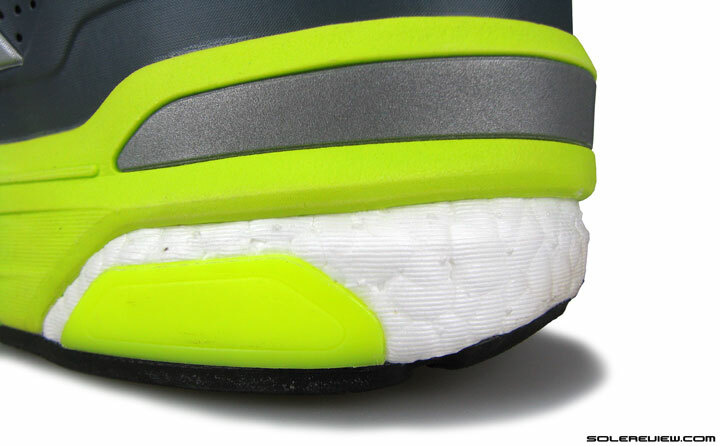 Unlike the previous Sequence, the foot is closer to the Boost foam. There’s no firm EVA foam over the Boost midsole, and the lasting is generously perforated in the manner of the Ultra Boost. 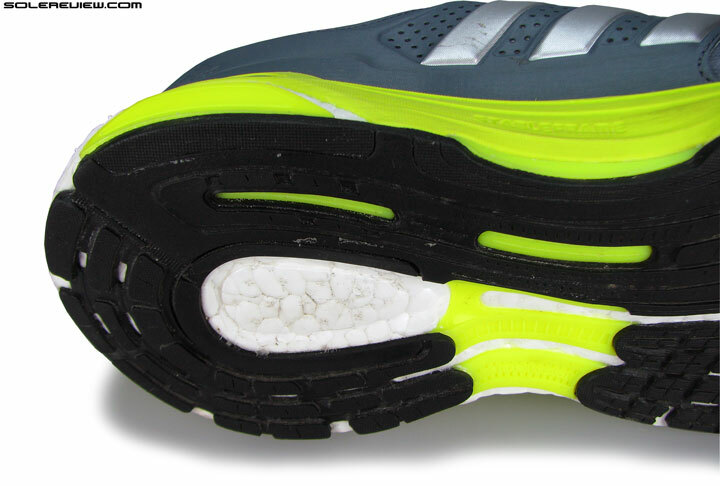 The removable insole is made of a thick, compression molded EVA foam. Even the outsole stretches a bit due to its windowed design. 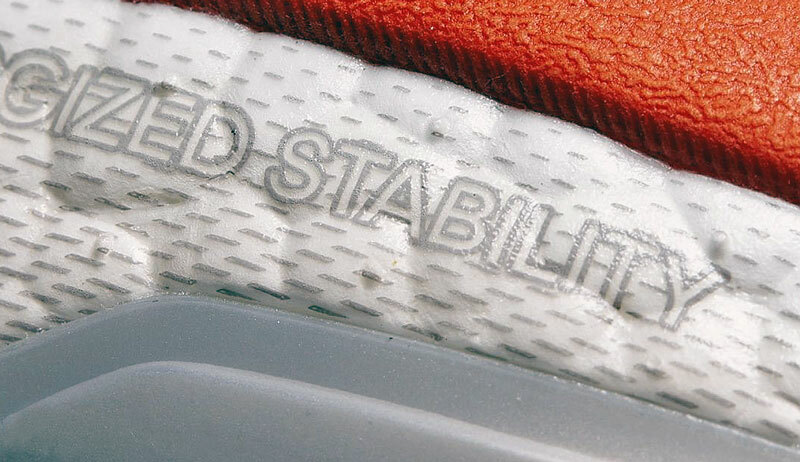 So every bit of the Supernova ST is engineered to deliver softness. The cushioning has a consistent feel from heel to toe, though the 30 mm heel stack (vs. 22 of the forefoot) ensures that the softness is heel-loaded. Ok, here’s a thing you should know. Considering how soft the ST is compared to the Sequence, the actual heel drop of the ST is going to be lower than the Sequence. In other words, the ST’s rearfoot is easier to compress than the Sequence. So ignore the stated 8 mm drop, because the ST’s dynamic offset (with body weight) is going to be 2-4 mm lower than the Sequence 9. So if you experience any initial soreness which cannot be explained, then it’s the soft cushioning at work. Just wait it out a few days, and you should be good. This advice applies even if you’re switching from other non-adidas running shoes with a firmer ride and similar heel drop (8 mm). Few other midsole materials deliver as much spring-back as the adidas Boost, and the Supernova ST has a lot of it. Naturally, the shoe has a bouncy ride. However, we felt that the Supernova Glide 8 and Sequence 9 handled this aspect better under the rearfoot due to the firm midsole layering over the midsole. The new Supernova ST does not have a firm midsole topping over the Boost, so some of the responsiveness gets lost in the extra softness. Though the inner midsole has a combination of support-friendly elements such as the extended plastic shank, laminate, and the thicker EVA rim, the Supernova ST’s heel has a very soft ride. The lateral (outer) side lacks these supportive features, so the midsole is easier to compress on the outer side. This gives the heel a slight cushioning bias. Transitions are sluggish on the ST. The cushioning softness works great for the long runs at a relaxed pace, but once you dial up the speed, you’ll discover the shoe’s shortcomings. There’s a noticeable amount of sink in the rearfoot due to the abundance of Boost foam, and this keeps you from going fast. The Sequence 7, 8, and 9 ran much faster than the ST due to their firmer ride quality and higher levels of stability. The Supernova ST has a lot of cushioning served with a springy feel on the side, but we’re quite not certain whether this is a positive or a negative. It’s a plus if you like a soft ride, but then you suddenly remember that this shoe isn’t the Ultra Boost, but a ‘stability’ shoe. Compared to the past versions of the Sequence, the level of support certainly takes a backseat. There’s too much of upper material on the midfoot. We’ve long questioned adidas’s motives for using so much plastic, urethane, call it what you will. The fit does not feel natural, and many adidas running shoes lack the ‘disappear over the foot’ feel. Over-engineering also leads to a paucity of space, and it’s criminal that adidas shies away from offering optional widths. Durability is a definite positive in this case. Be it the hard-wearing Continental rubber outsole or the long-lasting Boost midsole, the Supernova ST possesses a life longer than most running shoes. The $130 MSRP isn’t entry-level but happens to be great value for the feature set offered with the ST. It might be the successor to the outgoing Sequence 9, but the 2017 Supernova ST is a vastly different product. Trimming down the Stableframe component makes a dramatic alteration to the shoe’s cushioning and stability manners. Not only is the ST much softer, but it also loses the supportive ride character of the Sequence. A softer ride also translates into slower transitions than the Sequence 7, 8, and 9. The ST is now better suited for the long and easy runs versus the more versatile nature of the firmer Sequence models. The upper fit has changed too. The forefoot is narrow due to the updated toe-bumper and layering over it, and the midfoot feels stiffer due to the large swathes of thick urethane. As you might recall, the Sequence 9 went easier on the midfoot layering. The heel abandons the traditional design for an Ultra Boost inspired Achilles lip, a change which loosens the heel’s hold around the foot. Cutting down on the Stableframe component yields a weight reduction of nearly half an ounce over the Sequence 9. The ST is now down to 314 gms/11.1 oz, compared to 324 gms/ 11.4 oz for the Seq-9. 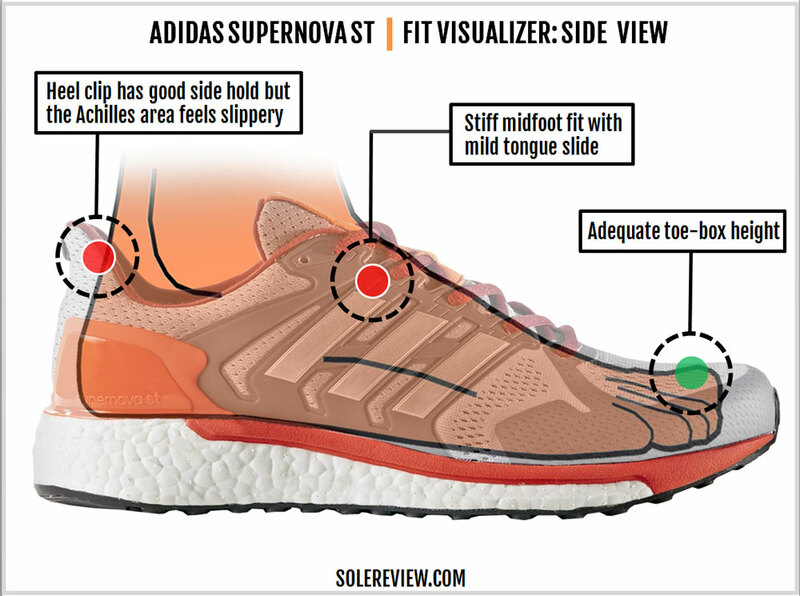 The Supernova ST has you covered as a shoe for the long and easy runs, so getting the Ultra Boost ST will be overdoing the whole cushioning angle. Instead, buying the adizero Tempo 8 makes better rotational sense. Besides, you’ll get the supportive Stableframe midsole on the Tempo, a feature which was present in the outgoing Sequence 9. If the Tempo 8 feels too much of stability shoe and you want a lighter version of the Supernova ST, then the Boston 6 is a shoe you should consider. For races of 5K, 10K and the occasional track sprints, the Takumi-Sen 3 flat is an excellent performer. The newly released Asics DS Trainer 22 compares with the adidas Tempo 8, so that’s an option too. Pair that with the lighter Asics DS-Racer 11, and you’re all set for shorter races. 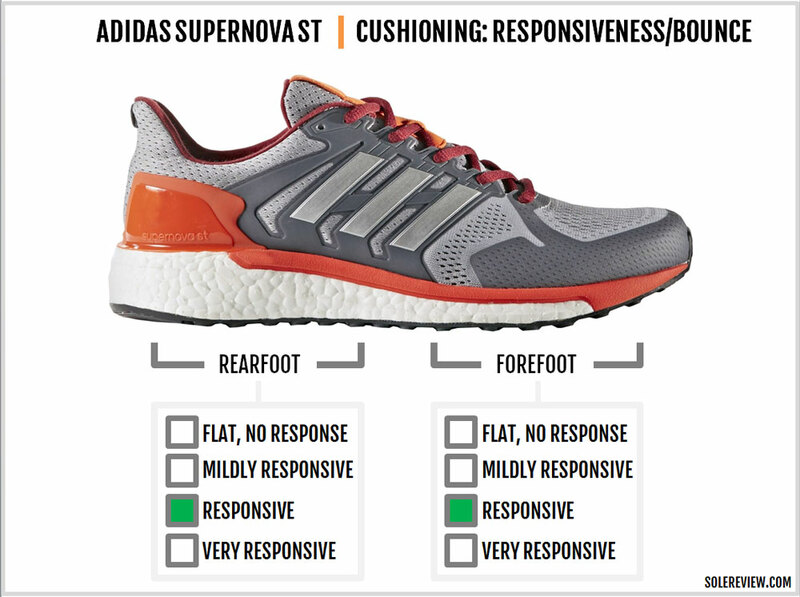 Though adidas has the more expensive Ultra Boost ST as its premium cushioned-support shoe, it doesn’t make a lot of sense to pay $50 over the Supernova ST. Do keep in mind that it’s the stability category we’re talking about, and the Ultra doesn’t offer increased support over the Supernova ST. If anything, the Ultra is less supportive and softer. Purchasing the Ultra make sense only if you want the Primeknit upper with its roomy fit (the Supernova fits narrow) or a more cushioned ride. Priced below the Supernova is the Vengeful, an entry-level support shoe. But for reasons described in this review, it’s best to skip the mediocre Vengeful till the time it gets an update – if at all, that is. 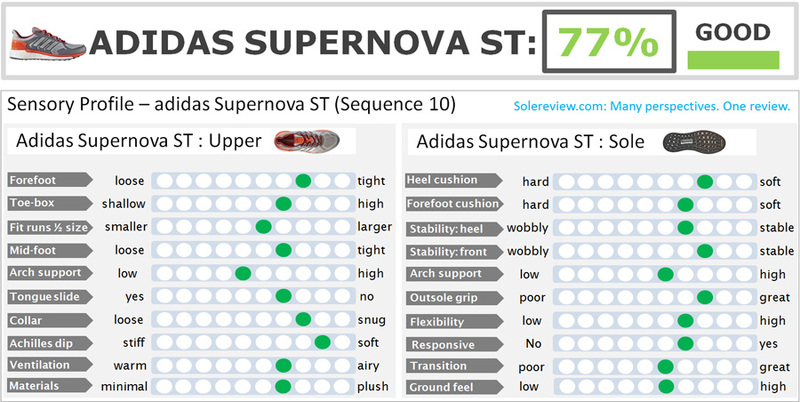 The new Supernova moves up in cushioning class, so this comparison chart is going to look different than the Sequence 9’s. 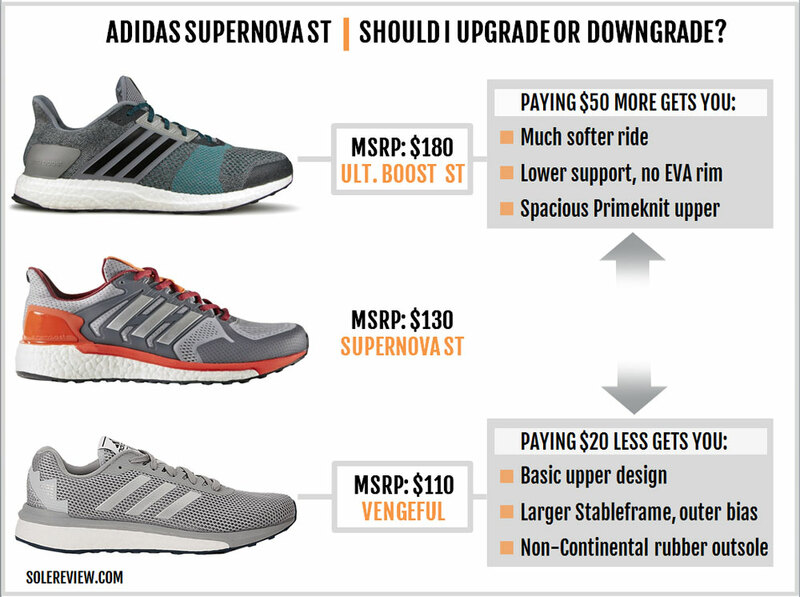 Coming to think of it, the Supernova ST shares more in common with the more expensive Ultra Boost ST rather than the previous model. The removal of the Stableframe midsole and replacing that with Boost foam and perforated lasting lead to a significant upside in cushioning. Other models in this category would be the Asics Kayano 23 with its Flytefoam midsole and visible Gel windows, the cushioned and supportive Brooks Transcend 4; or a traditional cushioned-stability shoe like the New Balance 1260 V6. The Mizuno Wave Paradox 3 and the Nike Zoom Odyssey 2 are firmer stability shoes. The Wave Plate sandwiched within the Paradox’s midsole lends the shoe its stability manners, and the Odyssey uses Zoom Air under the heel and forefoot to keep the ride supportive yet responsive. Though the adidas Supernova ST’s $130 MSRP makes it cheaper than all the shoes above, it has the softest ride of all, and the least supportive. High volume Boost is much softer than EVA, so do not expect the support levels of traditional shoes within this category.